Some cleaning here and there.. This doesn't happen on native hardware and or VMWare. I didn't test Qemu. Didn't install it, but had a quick look. 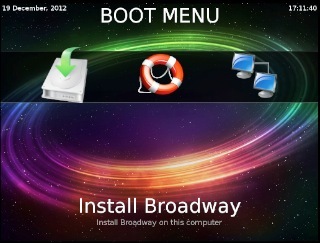 Broadway X was a little too big, 707mb, so I had to force it to burn. Not sure what was left out, but it booted. Not sure, how I got out of the black screen with the 3 big icons, (maybe it was ctrl-c). Suggest a window and not a screen. Maybe by "forcing" the burn something got lost. In a few month we will have finished the core stuff like update-mechanics / package manager... than broadway will be on track again.